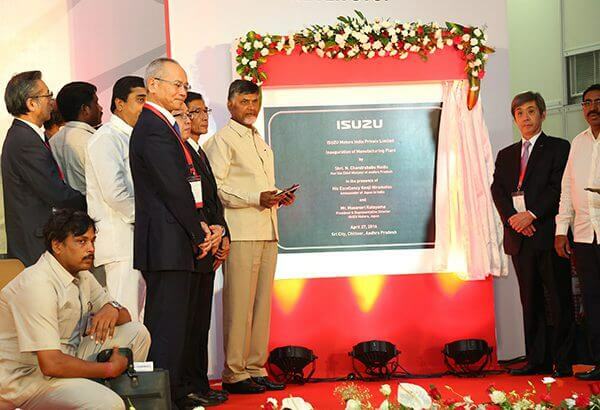 Sri City, April 27, 2016:- Japanese automaker Isuzu Motors new plant, built at an investment of Rs 3,000 crore in Sri City and which is the very first car manufacturing facility in AP, formally went on stream Wednesday in the august presence of the honourable Chief Minister of Andhra Pradesh Mr. N. Chandrababu Naidu. Isuzu’s first ‘made in AP’ product, viz., the new generation ‘ISUZU D-MAX V-Cross’, which is India’s First Adventure Utility Vehicle, was rolled-out of plant by the Chief Minister along with Mr. Masanori Katayama, President, Isuzu Motors Limited, Japan, in the presence of His ExcellencyMr. Kenji Hiramatsu, Ambassador of Japan to India and Mr. Seiji Baba, Consul General for Japan in Chennai. Reacting to Isuzu’s request the CM announced that road tax between AP and Telangana will be exempted. At the specific request of Sri City, the CM announced that the existing police outpost will be upgraded as a full fledged police station headed by a Dy. Superintendent. For imparting skills among the local youth he declared that soon a Skill Development Centre will be opened in Sri City. To meet the housing demands of the industrial worker, Mr. Naidu said state government will build a mega township in the close vicinity of Sri City. Commenting on the occasion Mr. Ravindra Sannareddy, Managing Director, Sri City said, “It is a very happy occasion for us, as yet another major unit has become operational. As Isuzu has a tie-up with several component suppliers, many of them have already zeroed in on Sri City for co-locating their production units.” “With the presence of auto major original equipment manufacturers (OEMs) and several automotive ancillary industries, there exists a strong ecosystem for automobile sector in Sri City. As the state government is very keen in developing this part of the state as an automobile hub, youth in this region will find ample employment opportunities,” he added. Others dignitaries present on the occasion, among others, included Mr. Kambhampati Ramamohan Rao, Special Representative of the Andhra Pradesh government in Delhi, AP ministers Mr. B. Gopalakrishna Reddy and Mr. Narayana, Satyavedu MLA Mr. T. Aditya, Mr. Sidhartha Jain, District Collector, Chittoor, a host of senior officials of AP government, and Senior executives of IMI and Business partners of ISUZU. This production plant which is spread over an area of 107 acres, will manufacture the new generation of ISUZU D-MAX pick-ups in multiple models and variants, and will cater to a wide range of customer segments. The annual production capacity of the plant is 50,000 units that can be scaled up to 120,000 units in future. The bookings for the new generation ISUZU vehicles will soon be started followed by deliveries at ISUZU dealerships all over India.